Trail Guide by Andrew Shelley – thanks Andrew! EXACT LOCATION: From Seddonville drive 10km up Charming Creek road to the start of the walkway. Or, if you want a longer run, stop at the Seddonville Hotel and run the 11km up Gladstone Rd and Charming Creek Rd. Charming Creek Rd is entirely unsealed and for the most part winds its way through the bush. TIME TO RUN: DOC time 3 hours; Novice 1h 20, Elite 40 mins. Allow plenty of extra time to stop, take in the sights, and take photos. TOTAL ASCENT: 116m TOTAL DESCENT: 213m; both figures starting from the Seddonville / Charming Creek end of the walkway and finishing at Ngakawau. DEFINING CHARACTERISTICS: Native bush, gentle gradient, lots of (small) old railway sleepers, easy running. Several tunnels and two swing bridges to negotiate. Beech forest. FEATURES OF INTEREST: The entire walkway follows an historical tramway route used for transporting coal. Parts of the tramway remain, with sleepers along a lot of the route, and rails remaining through the Ngakawau River Gorge. Remains of old equipment are in several locations with better preserved items in some areas, in particular the old mill steam engine at the Mumm’s Mill site. At the top of the Gorge is the spectacular Mangatini Falls. Most of the route is through native bush, with part of the northern end through grassland. RUN IT: There’s not really any chance of getting lost as in most places the trail is extremely obvious and there are no alternatives. From the Seddonville / Charming Creek end of the walkway, run about 100m along the road and cross the bridge to the old Charming Creek coal mining site. There are quite a number of relics here to explore, although most are fairly decrepit. Continue along the track and you will reach a very well preserved upright boiler at the point where the track steps up under a rock overhang. The track has a few twists and turns, but generally runs straight with long gentle curves as it follows the old tramway formation. The next site of historic interest is Mumm’s Mill – here there is the well-preserved remains of the old mill steam engine, complete with flywheel. This is housed in a shelter together with information boards about the coal mining operations in the area. Just before a small swing bridge is what looks like a sulphur spring, with water bubbling up out of the ground, a strong smell of sulphur, and yellow deposits around the edge of the spring. This is, in fact, an old drill hole from when the area was tested for coal in the period 1910-1912. Watson’s Mill has a number of old boilers and other items of machinery, and again a shelter with information boards – this time about the logging operations in the area. From this point on the rails from the old tramway are largely intact, with the track seldom deviating from the railway formation. 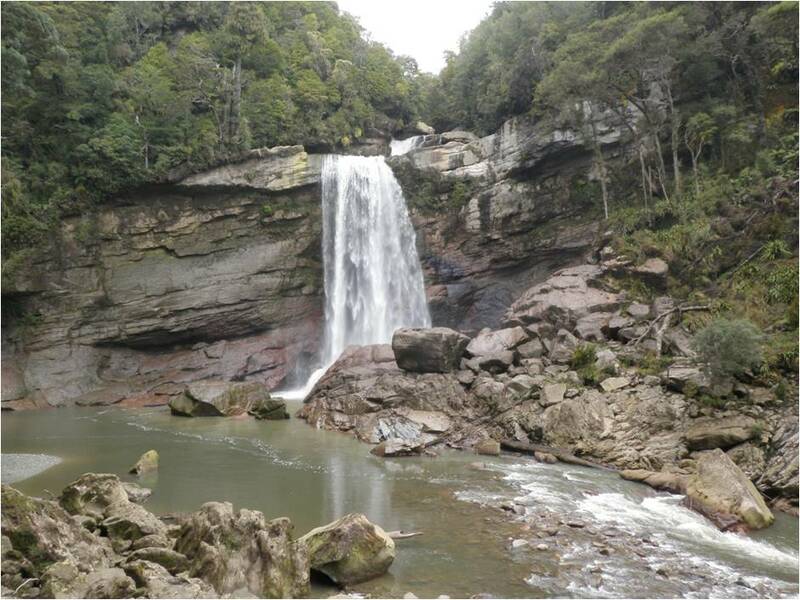 Mangatini Falls – visible before a tunnel, then after passing through the tunnel are visible in much more spectacular fashion. A side track down to the river allows even closer views. 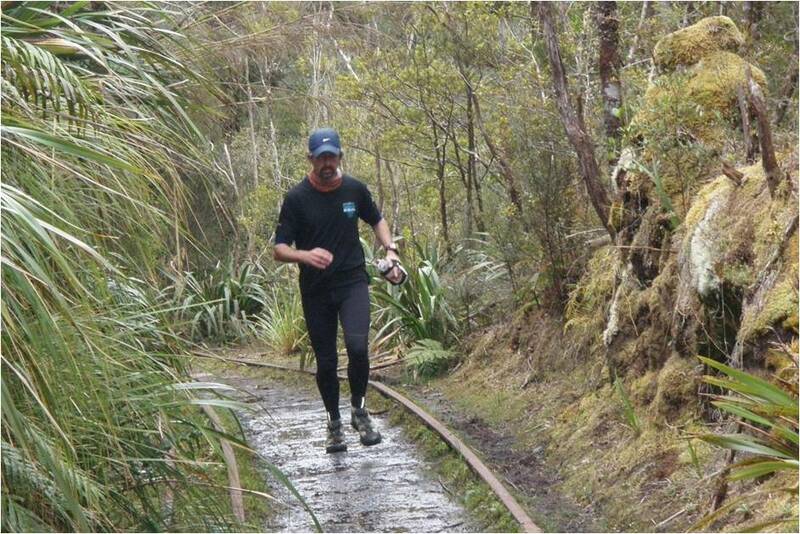 Continue down the trail and then over a swing bridge and on down through the lower Ngakawau Gorge. Shortly before the end of the trail you will reach an area called “The Bins”, again with more relics to explore. There are two trail options at the southern end of the Bins – the main line back to the carpark, or a siding, which then has a set of steps that drop down to the main line. On the last stretch out to the carpark there are views down the Ngakawau River to the road bridge and (almost) the coast. POST RUN GOODNESS: If finishing in Seddonville, the Seddonville Hotel (which also doubles as the cafe). This is the ONLY cafe in town! A quaint and clean hotel that provides exactly what you’d expect from a West Coast pub. Look for the flood marks in the main foyer from the December 2010 flood, and the historical photos of the area on the wall of the restaurant. If finishing in Ngakawau, head south to Granity and the Drifters Cafe. 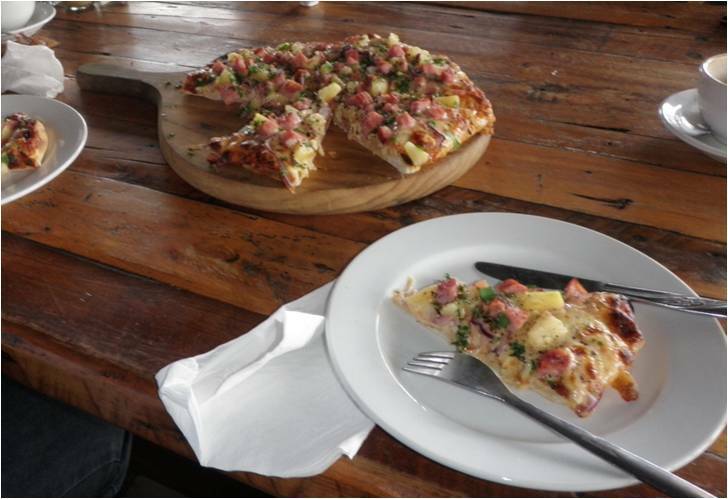 Drifters serves the best pizza on the West Coast, and possibly in New Zealand. If finishing in Seddonville, it’s still a great place to stop if your route home takes you down this way.